A++++++ Seller and fast delivery!! Thank You! Great Price. Excellent safe packaging. Superfast Shipping. Thank You. Perfume is fresh, paper-tobacco smell, light, the smell lasts quite a long time. Awesome deal and lightning fast shipping! Smooth transaction but, please tape down perfume bottle caps and boxes. Very good products.Fast shipping. I really recommend it.thank you soo much. I believe this is a fake because their is hardly any fragrance after a few min. 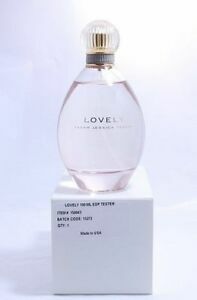 This particular perfume "Lovely" by Sara Jessica Parker, is very lightweight. Pleasant fragrance. It is not overpowering or loud like some scents. Very quiet and refreshing. Draws tons of compliments and is long lasting. I love it especially working around others, doesn't make them "choke" like some of my other fragrances. I will continue to be a big fan of the scent. I love this fragrance it is very soft and gentle , not over powering. Sweet & Flowery with a Little Musk to Draw Compliments! This perfume is sweet like flowers with a little bit of musk. Lovely is very feminine, not too heavy but lasts about half the day! I had never tried this before but now I am a fan!